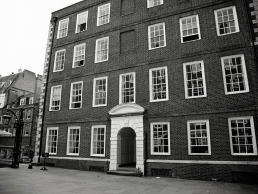 New Court "houses a range of barristers proficient in disputes involving both children and financial remedy matters. Members act in a wide range of serious public law issues, representing guardians as well as the local authority in cases of abuse and non-accidental injury, including those involving complex medical evidence. New Court Chambers also fields strength across the private law spectrum, and has members with expertise in TOLATA and Schedule 1 cases." In addition, Christopher Poole (family: children), Giles Bain (family: children) and Sally Jackson (family: children and matrimonial finance) are ranked again as leading individuals and for the first time Philippa Jenkins (family: children) is recognised in the directory. The February 2018 edition of the New Court Newsletter is now available. Alyssa Howard provides a comprehensive update on recent private law children cases, while pupil Meredith Major considers some of the pitfalls of FDR hearings. 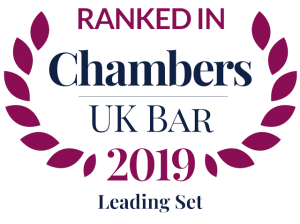 Robert Wilkinson rounds up the latest news from chambers including reported cases, charitable exploits, parties and new babies! Chambers is delighted that Jemimah Hendrick has accepted an offer of tenancy after successful completion of her pupillage with New Court. Jemimah practices in all areas of family law including public and private law children proceedings, financial relief and TOLATA. Jemimah also undertakes work in the Court of Protection. Jemimah appears for local authorities, parents and children’s guardians and has appeared in front of all levels of tribunal from Magistrates to the High Court. We wish her the very best in her career with us. 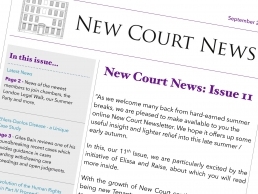 The September 2017 edition of our Newsletter, New Court News, is now available. The Summer has seen Chambers strengthening in terms of members of chambers and within the clerks' room. Matthew Burman has joined us from St Albans Chambers continuing our strong links with work in the Luton and Bedford areas, and Amelia Evans has joined us from 1 Gray’s Inn Square. We have also added to our ranks in the clerks' room and we are very pleased to welcome Amie Smith who joins us as Third Junior clerk. 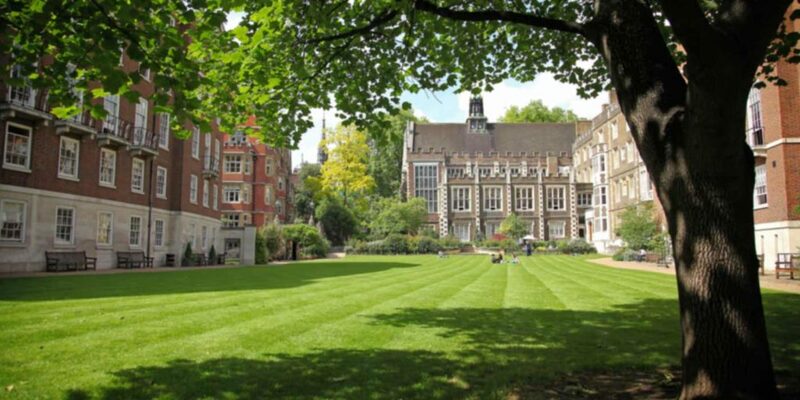 We wish Matthew, Amelia and Amie great success in their new chapters at New Court. In this article I will provide a summary of the most recent case law which has provided helpful guidance in respect of procedure; whether damages should be awarded; quantum of damages and costs. Section 7 HRA 1998 sets out the parameters of the protection provided under the Convention and section 8 HRA 1998 sets out the remedies for a breach of the Convention rights. When considering any Human Rights Claim practitioners need to keep in the forefront of their mind three principles. Firstly, whether the court should make a declaration that X Local Authority has breached Y’s right(s); Secondly, if X Local Authority has breached Y’s right(s) should Y receive damages, if so how much; and lastly what costs, if any should become payable. the inherent jurisdiction is not the appropriate vehicle by which to argue human rights claims. Re P v A Local Authority  EWHC 2779 (Fam) is a case which involved wardship proceedings rather than section 31 Children Act proceedings. Keehan J considered in detail the provisions for the statutory charge arising out of Legal Aid. Keehan J found the child’s Human Rights Claim had nothing to do with the declaratory relief granted to the child in the wardship proceedings and therefore he was satisfied that the damages resulting from the Human Rights Claim should not be subject to the statutory charge. In 2017 there have been a number of cases which practioners need to be alert to and I would urge all practioners to consider each judgment in full. The first case which I would invite you to consider is London Borough of Hackney v Williams & Anor  EWCA Civ 26. Whilst this judgment focuses more on Section 20 Children Act 1989 it is worth practitioners considering. Sir Brian Leveson P found that the parents in this instance failed to satisfy the court that the local authority had breached the terms of the statute [paragraphs 76-77]. He emphasised that nothing in his judgment is intended to, or should be read as, altering the content and effect of the guidance in family cases in respect of good practice around section 20 agreements [paragraph 77]. Sir Brian Leveson P went on to find that the parents should not have been granted an extension of time in which to bring the proceedings pursuant to section 7(5)(b) HRA 1998 [paragraphs 78 - 86] and further he remarked that had there had been a breach he would not have awarded a sum even approaching £10,000 to the parents [paragraph 87]. the Legal Aid Agency should inform the court and the parties of its decision before the final hearing. Cobb J was of the view the decision in of Keehan J in P v A Local Authority  EWHC 2779 (Fam) provides little assistance to the majority of potential HRA claims which arise in the context of family proceedings under the Children Act 1989. Cobb J went on to consider quantum of damage; he endorsed the test that any award must be determined by reference to what is “equitable” Regina v Secretary of State for the Home Department (respondent) ex parte greenfield  UKHL 14 and having considered the comparable awards made by the English Courts he considered the figure agreed between the parties represented an appropriate sum to give “just and fair satisfaction” to each of the claimants. He went on to consider the issue of costs and how, if at all, this should affect the quantum awarded for damages. Cobb J found it was unprincipled and against Parliament’s intention to significantly increase the damages award to avoid the effect of the statutory charge. The award for damages are awarded to reflect the infringement only. He stressed that when considering the issue of costs, the court must have regard to the parties’ litigation conduct and whether costs are reasonably or not reasonably incurred. Costs incurred in respect of the care proceedings should be determined under the Family Procedure Rules and costs incurred in respect of the Human Rights claim should be determined under Part 44 Civil Procedure Rules 1998. He agreed with guidance offered by Keehan J in H v Northamptonshire County Council & the Legal Aid Agency  EWHC 282 (Fam) at paragraph 117. In the past five months the guidance provided in respect of procedure, costs and the statutory charge is incredibly helpful. Unfortunately, there still remains scant guidance in respect of quantum for damages, which is left to the discretion of the court; this will no doubt continue to be litigated in due course. 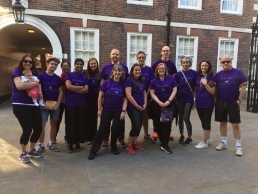 With leg muscles (and a few sore heads) now fully recovered, we are delighted to have raised £1639.75 in support of advice centres which help thousands of people including the homeless, housebound elderly, victims of domestic violence and people trafficking and many more. Thank you to everybody who donated and supported us along the way. We'll see you for next year's walk! Chambers is delighted that Alyssa Howard has joined chambers as our newest tenant. Alyssa, called in 2014, has a considerable amount of experience as a family advocate having undertaken pupillage at 4 Paper Buildings and been a tenant at No 5 Chambers. Alyssa has also spent a period working as in-house counsel for Shoosmiths LLP and so brings with her a wealth of experience in both Private Children and Financial Remedies as well as Chambers’ core practice area of Public Law Children work. 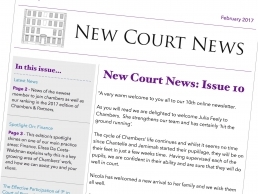 The February 2017 edition of our Newsletter, New Court News, is now available.